Most Reverend Bishop Frank J. Dewane serves as the spiritual leader of more than 227,000 Catholics in the 10-county Diocese of Venice in Florida. He was appointed by Pope Benedict XVI in 2006 as the second Bishop of the Diocese. 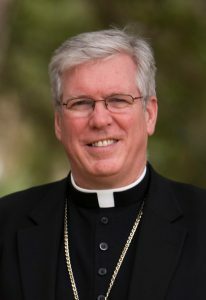 Bishop Frank J. Dewane was named Coadjutor Bishop of the Diocese of Venice in Florida by Pope Benedict XVI on April 25, 2006 and on January 19, 2007, he was installed in his current role as Bishop of the Diocese. Bishop Dewane holds degrees from the University of Wisconsin, The American University in Washington, D.C., as well as from Pontifical Gregorian University and Pontifical University of St. Thomas Aquinas, both in Rome. Prior to entering the seminary, Bishop Dewane worked for the National Broadcasting Corporation (NBC) in Moscow, Russia, and then for a subsidiary of PepsiCo in New York City. Ordained to the priesthood for the Diocese of Green Bay in 1988, Bishop Dewane was appointed in 1991 to serve as a member of the Permanent Observer Mission of the Holy See to the United Nations in New York City, during which time he represented the Holy See at several international conferences. In 1995, he was transferred to the Pontifical Council “Cor Unum” and was later appointed Under Secretary of the Pontifical Council for Justice and Peace. Bishop Dewane currently serves on several committees at the United States Conference of Catholic Bishops including the Administrative Committee of the USCCB, Chair of the Committee for Domestic Justice and Integral Human Development, and is a member of the Committee for Religious Liberty. Most recently, he has been named the Consultant for the Ad Hoc Committee against Racism. In addition, Bishop Dewane is a member of the Board of Directors of the Franciscan Foundation for the Holy Land. Bishop Dewane was born in Green Bay on March 9, 1950, the third child of Eleanor and Ben Dewane, devout Irish-Catholics who owned and operated a dairy farm. St. James Parish in Cooperstown, Wisc., was the center of community life for the Dewane family, which included four children. After high school graduation Bishop Dewane attended the University of Wisconsin where he earned a bachelor’s degree in Social Sciences. He earned a Master’s Degree in International Administration from The American University in Washington, D.C.
Bishop Dewane began his studies for the priesthood at Notre Dame University in South Bend, Ind., where he completed one year of philosophy. He then studied theology at the Pontifical Gregorian University in Rome. While in Rome, he also completed advanced studies in canon law at the Pontifical University of St. Thomas Aquinas. Served on Pontifical Council "Cor Unum"
On April 25, 2006, Pope Benedict XVI named him Coadjutor Bishop of the Diocese of Venice in Florida. On July 25, 2006 Bishop Frank J. Dewane was installed as the second bishop. Became a member of an international delegation of Church leaders on a mission to press G8 European leaders to honor commitments made to aid Africa. Member of an international delegation from Catholic Relief Services which celebrated the 50thAnniversary of CRS’s work in Tanzania.